I'm taking a break from outfits in fall earth tones and neutrals for today... and adding a little SPARKLE to your Monday. 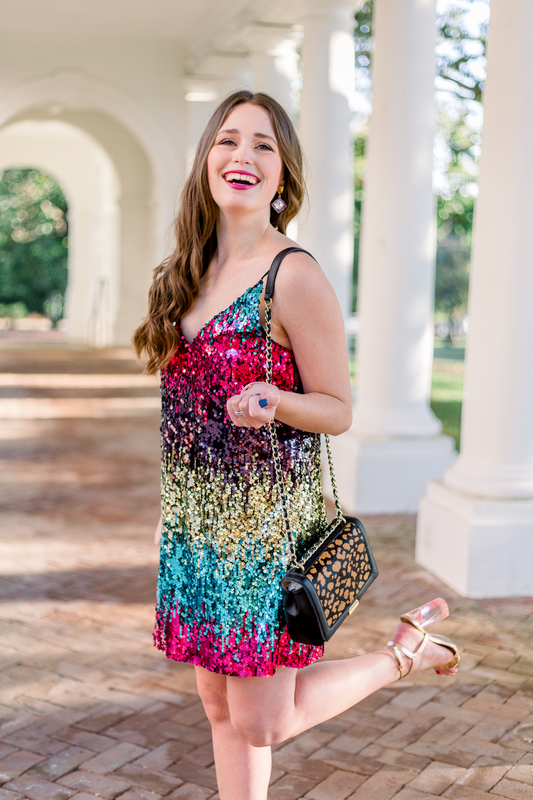 Talking all about sparkly holiday and NYE party dresses that are all under $40! Every Monday needs some sparkle right? I thought today would be the perfect time to share this darling dress. Sure, mid-November is still a little early to be thinking about New Years' style... but at the same time, why not buy your outfit for NYE early, and then not have to think about it until then? Plus, this fun dress could also work for other dressy holiday occasions before then. Can you believe that this beautiful dress is a Shein find?! I'm very happy with the quality- look how bright and beautiful the sequins are! I ordered a M in this (I typically size up and order M in Shein), however this dress runs a bit large for them! I probably could've gotten away with a S, my normal size for other retailers. But the fact that it is a little loose on me makes it more comfortable to wear, so I guess that's a win. 😊The colors in this dress make me think of Las Vegas- one of my favorite cities! My mom bought me these super cute heels for a wedding that I went to this summer! Sadly my pair is sold out now, but these are really similar. Since this dress is so colorful and eye-catching, I wanted my accessories to compliment it, and not compete with it. I love these crystal drop earrings from Sugarfix, and I added in some of my favorite Kendra Scott bracelets as well. I hope y'all are having a good Monday! Last week was a really long week at work. I love working in radio because I genuinely love what I do and I really do have fun most days at my job, but last week was a (rare) week that my job felt more like stress and less like fun. I'm hoping this week will be off to a great start! Linking my dress below, and some other cute sequin ones from Shein!! What a fun dress!! I love all the colors! I have no idea what we are doing for NYE but one of these dresses would be so fun! You look gorgeous! This is seriously the most fun dress for the holidays ever! I am loving all of these sparkly dresses lately! The one you're wearing is stunning! While I cannot think for the life of me a good reason to own that dress, I want it. 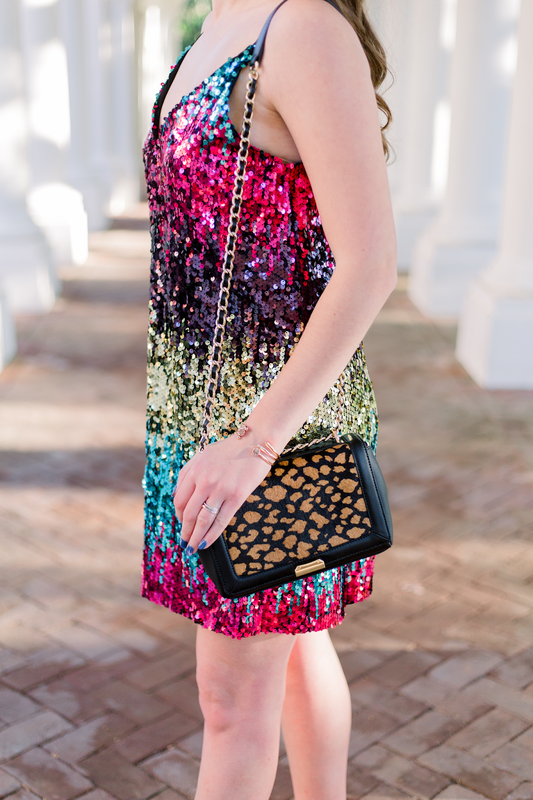 The colors are so pretty and sequins make everything more exciting! Seriously LOVE that dress. I'm still looking for the perfect Christmas dress! Thanks for these options. This looks like such a fun and sassy dress. Love it! I love love love sparkly dresses. This one is absolutely stunning! I love that sequin dress! I saw a similar one at Express over the weekend. I am OBSESSED with this dress. Beyond obsessed. 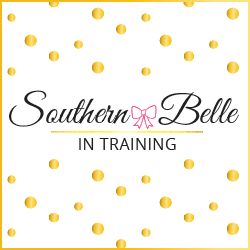 SO gorgeous and it looks amazing on you! I loveee the colors! I need it for NYE! I love how fun and bright this dress is! I'm a sucker for anything sparkly! And it looks amazing on you!